As Christmas is fast approaching and our Elf on the Shelf has been up to all kinds of activities. Tonight, we decided to have our elf set up a letter writing station for our son to write his letter to Santa. 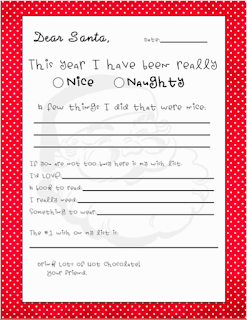 He is in first grade, so he is well on his way to writing quite well, but in the spirit of the season it is easy for the little ones to become fixated on what cool toys and gadgets they would like for Christmas. In an effort to have my son have a bit more of a review of his year and think about the things that he really wants, needs, and likes I came up with a a pretty cute letter! I thought I would share in case anyone else wanted to use a similar idea. Happy Holidays to all of you! !